In the nineteenth century, university faculty published in ways quite different from modern professors. Rather than disseminating their work in scholarly journals, they used several different media available at the time. This was true for Theophilus Wylie. He published in newspapers and popular periodicals. The items below represent the ways in which T. A. Wylie disseminated his scholarship during his tenure at Indiana University. In 1859 Theophilus Wylie published this article in the American Journal of Science, the principal scientific publication in the United States. Theophilus Wylie assisted with observations for this article published by Daniel Kirkwood in the Monthly Notices of the Royal Astronomical Society in 1867. In the nineteenth century, there were a smaller number of American scientific publications in which university faculty could publish. These two articles represent the kind of scholarly work in which Theophilus A. Wylie engaged. These two articles show a diversity of scientific interests including geology and astronomy. Wylie also collaborated frequently with Daniel Kirkwood, another faculty member at Indiana University. Theophilus Wylie wrote this letter to John Fries Frazer in 1850; it discussed the discovery of gold in Indiana. 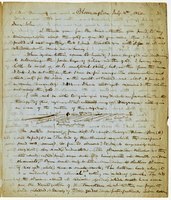 This is the report on the letter Wylie wrote to Frazer as recorded in the Proceedings of the American Philosophical Society. This is another report of the letter Wylie wrote to Frazer published in the Journal of the Franklin Institute. Theophilus Wylie later thanked John Fries Frazer for reading his letters and asked Frazer for some assistance on other matters related to physics. In the seventeenth century, scientists would often write letters to publications such as the Philosophical Transactions of the Royal Society of London. Those letters would then be published in the journal or read out at meetings. This practice of sending letters and having them read out and published continued into the nineteenth century. Theophilus Wylie wrote a letter to his friend John Fries Frazer, a professor and later provost at the University of Pennsylvania. 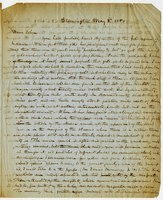 Frazer read these letters at meetings of the American Philosophical Society and the Franklin Institute, both scientific institutions in Philadelphia. T. A. Wylie published this geological report in the Indianapolis Journal, one of Indianapolis' newspapers. 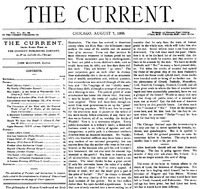 Wylie wrote this article for a literary magazine called The Current published in Chicago. It tried to solve the question of how the mind is created in materiality. 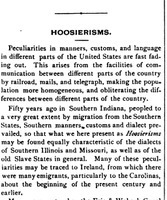 Wylie also published in The Current documents "Hoosierisms" or ways that the native people of Indiana spoke differently from other people in the U.S.
Wylie's lectures were often reviewed in professional literature. This summary of a public lecture he gave to the Southern Indiana Teacher's Association was published in their newsletter. In 1881, Theophilus Wylie wrote this article in Scientific American, which was one of the popular scientific magazines at the time. After his retirement, Theophilus Wylie wrote this history of Indiana University written largely for alumni and others interested in the local history of the university. Theophilus Wylie also wrote many articles for popular magazines at the time. In fact, Wylie seems to have written more popular articles than academic ones. Wylie's seeming preference for writing for wider audiences marks a clear difference between nineteenth-century and modern university professors; though some professors do write for wider audiences, much publication done by scholars in the twentieth and twenty-first centuries is written for specialized academic journals, not newspapers or magazines. 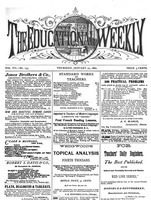 These items represent pieces that Wylie wrote for a wider audience, perhaps reflecting Wylie's interest in universities as a center of education not only for students and other scholars, but also for the citizens of the state of Indiana.